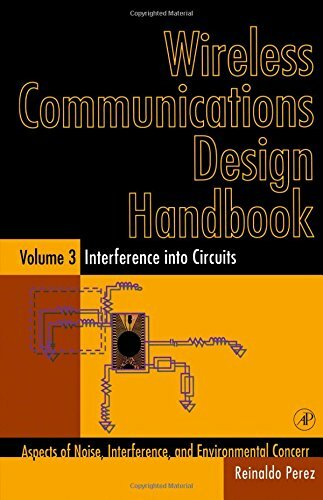 Amazon.com description: Product Description: The need for controlling interference and limiting noise problems in wireless communications systems starts at the most fundamental levels of circuit design. When efficient approaches for noise control are implemented at the circuit level, it helps significantly to ensure the effective noise control for the overall system design. This book is a practical reference for engineers who are particularly interested in practical case studies covering how to avoid undesired interference and noise problems in their designs. It covers a significant number of chapters dedicated to different aspects of digital, analog, and mixed mode analog/digital design which are directly affected by noise and interference issues. Each of the three Wireless Communications Design Handbook volumes addresses theory and immediate applications. The approach followed is strictly hardware-oriented. The material presented provides a good, practical, and theoretical background of noise sources and their analysis, as well as methodologies for minimizing interference problems in electronic design. About: The need for controlling interference and limiting noise problems in wireless communications systems starts at the most fundamental levels of circuit design.